Chrysler stores dont get the terms GM dealerships do at GMAC. 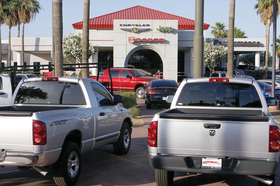 Above: Performance Chrysler-Jeep-Dodge in Phoenix. GMAC Financial Services has introduced an inventory finance program for Chrysler LLC dealers with stricter requirements than the program that the lender has in place for General Motors dealers. Chrysler dealers will face a faster repayment schedule on older units in stock, according to a copy of the finance contract obtained by Automotive News. Chrysler dealers must make monthly payments totaling 10 percent of the original outstanding balance on new vehicles that have been sitting on the dealership lot at least a year. By contrast, GM dealers make monthly payments totaling 10 percent of the original balance on new vehicles that have sat on dealership lots at least 18 months. And GMAC will finance just 80 percent of the purchase price when Chrysler dealers buy used vehicles at auction, compared with 100 percent for GM dealers. GMAC also has imposed a $25 surcharge on Chrysler dealers for new vehicles that have been sitting on their lots for at least a year, and $15 on each used vehicle sitting on their lots at least six months. At a time when sales are slow, dealers say they don't need extra fees. The auction finance policy is troubling for dealers who rely on late-model used vehicles to make up for losses in new-vehicle sales. While Chrysler dealers say they are grateful to have a credit line, they say they are concerned about GMAC's stiff terms. "For a lot of dealers, this is like negotiating the price of a life preserver while the ship is sinking," says Mike Charapp, a McLean, Va., dealer attorney. Over the past year, lenders have increased rates on dealers' inventory loans, known as floorplan. In this tight credit environment, some lenders no longer provide floorplan credit lines for dealers or refuse to take on new accounts. GMAC has agreed to become the primary lender for Chrysler LLC dealers once Chrysler LLC emerges from bankruptcy, and the captive also is providing wholesale and retail financing to Chrysler dealerships during the transition. "We are trying to on-board thousands of dealers in a quick time frame," says GMAC spokesman Mike Stoller. "We're part of the industry solution, not the problem." Chrysler Financial temporarily froze commercial lending programs after Chrysler filed for bankruptcy April 30. The bankruptcy filing caused creditors to stop funding Chrysler Financial's wholesale lending programs, court records say. Stoller refuses to discuss details of GMAC's interim floorplan agreement with Chrysler dealers. In a few months, the lender will renegotiate long-term finance agreements. At that time, GMAC may consider more favorable loan terms based on the dealer's individual merits, Stoller says. Andy Palmen, owner of Palmen Motors in Kenosha, Wis., is a member of the Chrysler national dealer council. He has lined up independent banks to finance inventories at his Chrysler, Dodge and Jeep dealerships, but uses GMAC to floorplan inventory at his Chevrolet store. "Most dealers will appreciate those floorplan lines," Palmen says. "What else are you going to do if you are with Chrysler Financial? As GMAC gets everyone established, hopefully, they will circle back and change those agreements."